ImageJ is an open-source image processing suite originated by the National Institutes of Health. It is well suited to scientific and medical imaging applications. Fiji (Fiji Is Just ImageJ) is a distribution of ImageJ that includes additional plugins. Although the extra plugins required for the SpectralRTI_Toolkit can be downloaded separately, we recommend starting with the Fiji distribution. ImageJ and Fiji require Java, which can be downloaded together with the installer if it is not already installed on your system. Copy the contents of the folder plugins to the plugins folder in your instance of Fiji. To install subsequent updates to the Toolkit the key file for the plugins folder is SpectralRTI_Toolkit-0.0.9.jar. 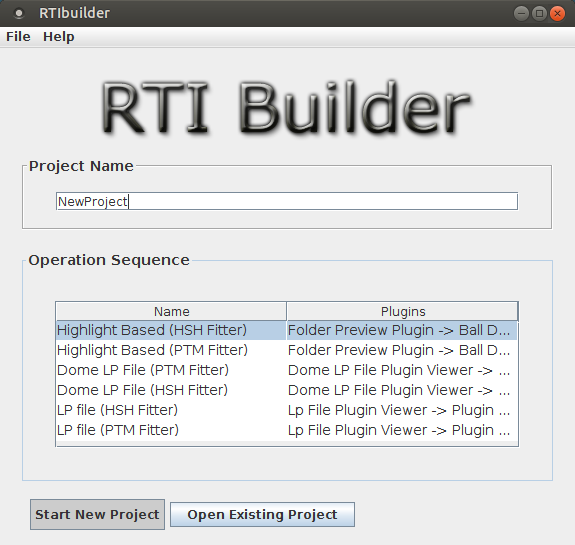 The RTIBuilder distributed by Cultural Heritage Imaging is the best way to create an LP file (unless you already have one) and also includes the HSHfitter required for creating RTI files. Windows and MacOS installers are available from http://culturalheritageimaging.org. The Toolkit will give the option of creating "Static Raking" images. "Static" contrasts with dynamically relightable RTI images. "Raking" means any angle of light among the hemisphere captures. Utilizing this option avoids lossy jpeg encoding (currently required for RTI) and creates files ready for IIIF Image repositories (tiled and layered). To utilize this feature it is necessary to download a jpeg2000 encoder. The best available is Kakadu. The executables for Windows, MacOS, and Linux can be downloaded from http://kakadusoftware.com/downloads/. Data captured by the Jubilees Palimpsest Project is available for download. Testing on this data can be a good introduction to the software before trying on your own data. A script downloads a set of the necessary data in the required folder structure. The script is available as a bash script (Linux, Mac) and command script (Windows). Note that some directories are optional (transmissive, fluorescence, KTK custom). It is strictly necessary that no spaces appear anywhere in the file paths. The Toolkit assumes that all input files are in the tiff format. Some adaptation to the Toolkit may be necessary to use other formats supported by ImageJ. There is not a good way to rotate RTI files after they are created so data should be rotated at this point, if necessary. 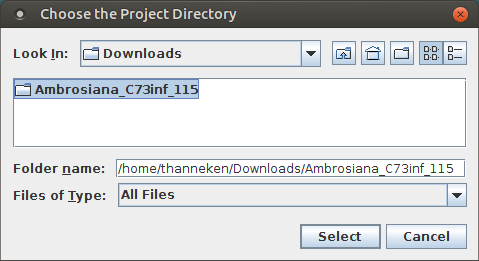 Locate the project directory folder that contains the sub-folders Captures-Hemisphere-Gamma, etc. Light Position Data Use this option to create the Light Position (lp) files necessary for RTI. Selected by default unless an LP file is detected in the LightPositionData subdirectory. Accurate ColorRTI Use this option to create an RTI file from the image in the AccurateColor subdirectory. Accurate Color Static Raking Use this option to create static raking images from the image in the AccurateColor subdirectory. This will create tiled and layered Jpeg2000 files for IIIF image repositories without subjecting the data to lossy encoding. Extended Spectrum RTI Use this option to create an RTI file from the Extended Spectrum (GLOSSARY) processing of the narrowband captures. Extended Spectrum Static Raking As above, use this option to create non-RTI images for a IIIF repository. 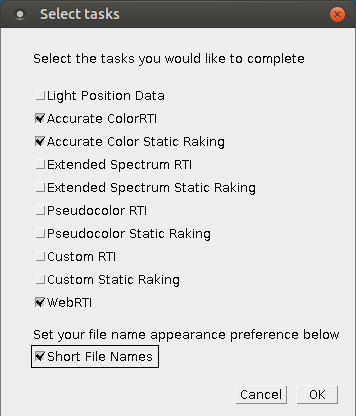 Pseudocolor RTI Use this option to create an RTI file from PCA Pseudocolor (GLOSSARY) processing of the narrowband captures. Pseudocolor Static Raking As above, use this option to create non-RTI images for a IIIF repository. Custom RTI Use this option to create an RTI file from an image created in external software such as ENVI. Custom Static Raking As above, use this option to create non-RTI images for a IIIF repository. WebRTI Use this option to derive tiles for WebRTI from the RTI files created above. Short File Names (recommended) Use this option to show only filenames without full paths in the interface. On the first run a window will notify you that rarely changed preferences will be saved. On subsequent runs previous selections will be listed and can be deleted or edited. The rarely changed preferences are as follows. Also accepts a batch file, such as deferredbatch.cmd, which is very useful for deferring the heavy computation that does not require user interaction. Can be 1, 2, or 3. Many consider 2 to be a nice balance of quality and file size. The maximum (3) will create a more precise and detailed representation of how the light changes. Allows the HSH fitter to use multiple CPU threads in parallel. For hshfitter compiled on Linux use 1. If “false” the full path to the file will be displayed in prompts such as the selection of Static Raking positions. If “true” the filename is displayed without the path. Adjust brightness of hemisphere captures? The hemisphere captures use the same exposure settings for all light positions, which is valuable for rendering RTI images, but leaves the static raking images too dark. Most users will want to normalize each image to a selected area for Static Raking images only. Yes, by normalizing each image to a selected area (recommended) Use this option if the brightness of the hemisphere captures is good for RTI but the static raking images should be brighter. Yes, by multiplying all images by a fixed value Use this option if the hemisphere captures are too dark even for RTI. Apply adjustment to which output images? 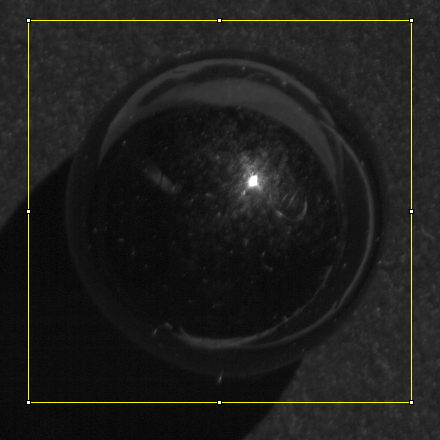 Static Raking images only (recommended) Use this option if the hemisphere captures have the good brightness for RTI. 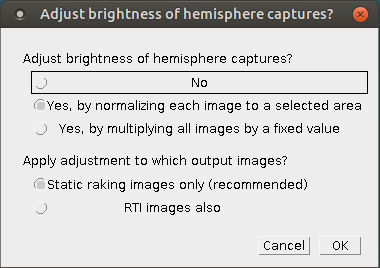 RTI images also Use this option if the hemisphere captures should be adjusted for brightness before RTI. This option appears if “normalizing each image to a selected area” was chosen on the previous dialog. This option appears only if a Captures-Transmissive-Gamma directory is found in the project directory and contains more than one image. If there is only one image it will be used without prompting. If there are several transmissive options one must be selected. If the best option is not known, preview the options in another program. This option appears if "Static Raking" was selected under "Select Tasks" previously. The prompt will list the images found in the Captures-Hemisphere-Gamma directory. Typically one might want low angles from four directions, minimally impacted by shadow from the copy stand. When using the MegaVision Arc for RTI the positions A03, A13, G05, and G13 are good choices. Otherwise, preview the options in another program to identify the best raking angles. This option appears if "Extended Spectrum" was selected under "Select Tasks" previously. 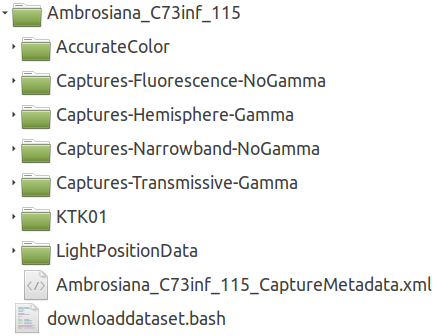 The prompt will list the images found in the Captures-Narrowband-NoGamma directory. The default options should work well if the filenames sort from shortest to longest wavelength. Roughly a third of the images with the shortest wavelengths should be assigned to the B (blue) category, the middle wavelengths to the G (green) category, and the longest to R (red) category. Use "none" if that image should not be used for Extended Spectrum processing. Situations and opinions differ with respect to how small the rectangle should be (e.g., should it include overtext), but it is at least clear that it should exclude non-artifact distractions such as the color checker chart. Pseudocolor images require two sources images (typically principal component images). Generate and select using defaults This option automatically uses the second and third principal components for the pseudocolor, which is often enough the best choice if the area for PCA analysis was well chosen. Generate and manually select two This will (later) require the user to go through a stack of principal component images and delete all but the two slices that most elucidate the desired target. Open pregenerated images This option takes a two-layer stack already generated in ImageJ or other software. The stack should in a folder called PCA in the project directory. 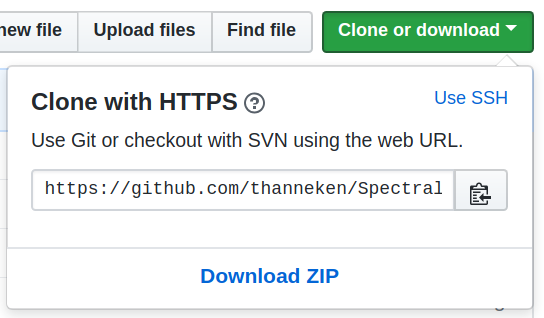 SpectralRTI_Toolkit can also take chrominance information from any stack of one, two, or three layers. The image should be in a subdirectory under the project folder with any name (e.g., CustomColor1, or in the example set, KTK01). Light position data is necessary for RTI (not raking). If a dome or arc is used the light position data can be calibrated once and reused (even with rotation). With a handheld flash it must be processed for each set. This is the beginning of the process to create a Light Position (lp) file. Make sure the rectangle includes the entire reflective sphere. Press cancel to discontinue Spectral RTI Toolkit or Ok to continue with other tasks after the lp file has been created. RTI Builder has its own Documentation. A brief summary is offered here. Click Open Folder and navigate to your Project directory and select the folder LightPositionData. Be sure to select that directory and not the parent directory or the jpeg-exports folder within it. If the capture went well each image should have a highlight (glare spot) on it, but you have the option of deleting failed shots here. Then press Next. The software tries to identify the center and radius of the sphere. Check by clicking on different images, especially "Median." If it is necessary to change the radius or center be sure to click Set New Center before Next. If the field "HSH Fitter Location" is not already filled, click Find and navigate to the file HSHfitter. Take note of the location, as you will need it later. Click Execute. The software may return "Fitting Completed" or an error message, but it does not matter as long as the LP file was created. Close RTIbuilder and return to ImageJ. At the prompt "Use RTI Builder to Create LP File" click OK. The processing will run for several minutes, depending on options selected. The straightforward option is to direct the prompt to the path RTIbuilder_v2_0_2\Fitters\HSHfitter\hshfitter.exe. See "Use deferredbatch.cmd" under "Tips for frequent use" below for the advantages of deferring HSH fitting. The deferredbatch.cmd is also convenient for running on Mac and Linux. This option does not change frequently so is remembered and set to default the next time the Toolkit runs. If not already downloaded at the installation stage (above), download webGLRTIMaker.exe from http://vcg.isti.cnr.it/rti/webviewer.php. 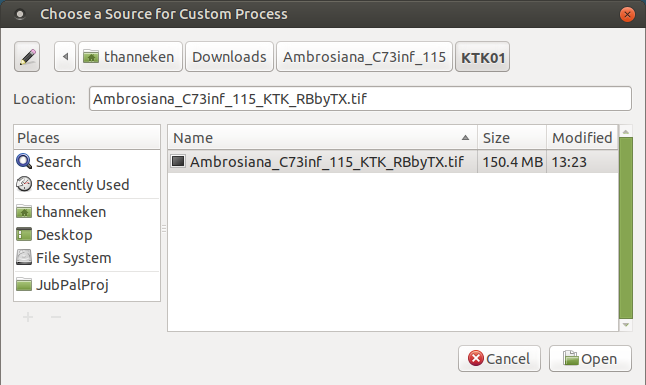 If not already downloaded at the installation stage (above), download from http://kakadusoftware.com/downloads/, install, and point the Toolkit to the kdu_compress executable. The location will be remembered on subsequent runs of the Toolkit. 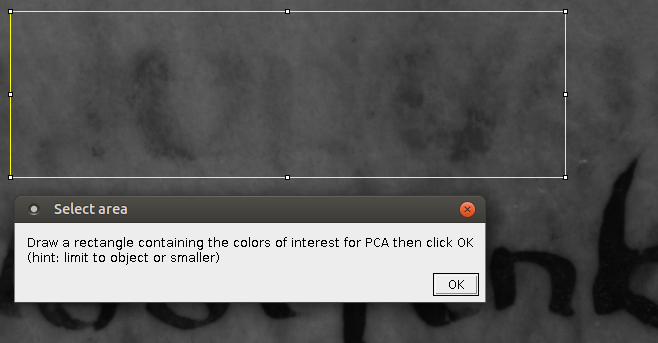 If PCA Pseudocolor was selected with the option to generate and manually select two slices (principal components), the following prompt will appear after PCA was run on the files in Captures-Narrowband-NoGamma and Captues-Fluorescence-NoGamma. This is also the most RAM intensive part of the process. If there are too many files in those folders consider deleting some files or moving them to a new folder such as Captures-Fluorescence-NoGamma-skip. If the images are too dark are light (which is likely) it will be helpful to enhance contrast. Draw a rectangle around a region of interest (a region that should not be washed out in black or white). Then use Process > Enhance Contrast and check Process all slices. The number of slices in the stack is equal to the number of narrowband captures. The last few are typically all black. Delete those, then delete the least helpful slices until two remain. Hint: navigate through slices with the , and . keys, which could also be thought of as < and > without shift. Let HSHfitter and WebGLRtiMaker run in batches overnight. You can save waiting by deferring the time-consuming HSH fitting process. This could also be helpful if you need or want to use multiple computers or operating systems. First, create a file named deferredbatch.cmd. Run the Toolkit and clear the selection for preferred fitter. When prompted to identify the fitter, point to the cmd file. Now the toolkit will add commands to the batch file rather than running the fitter. When you want to start the batch, execute the cmd file. If the HSH Fitter and WebGLRTIMaker (if desired) are not in your path you could add them in the operating system or as an initial command in the cmd file. When using a handheld flash a new LP file must be generated for each object (but not each color process). The beauty of a fixed dome or stable arc is that the LP file can be created once from a calibration sequence and reused. If some images are rotated (but the capture apparatus remains fixed) LP files appropriate for other rotations can be derived by switching columns and inverting values, as appropriate. The regular expressions to create a canonical lp file with rotation are as follow. For any project directory with the same light positions, simply create a sub-directory LightPositionData and copy the canonical lp file into the directory.